Two Bradford City swimmers have qualified for the World Masters Championships. Brendan Watson and Omar Hussain represented the City Of Bradford Swimming Club at the British Masters Championship Aberdeen meet held at the sports village in Aberdeen. The cities swimmers competed against top clubs including Guilford City, Barnet Coptall, Carlisle, Crawley, Coventry, Oxford, Luton, Birmingham, Norwich and Kilkenny (Ireland). Both swimmers excelled. 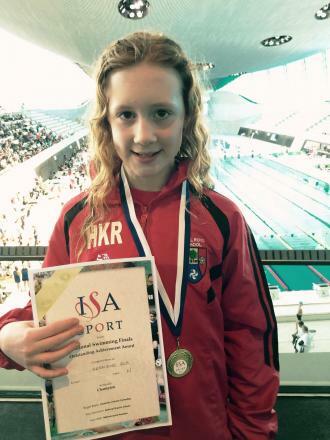 Watson won a gold medal in the 25-29 years age group and third place for the 200 metres backstroke. Hussain also had a great competition in the 30-34 years age group. Hussain made top seven finishes in the 50 metres freestyle, 50 metres butterfly and the 200 and 100 metres freestyle. City’s swimmers were chasing qualifying times for the World masters championships to be held in Budapest, Hungary in August 2017. Both swimmers train with Bradford Aquatics Competition Programme under the guidance of Senior Coach Andy Pearce and Development Coach Sarah Fisher. The City of Bradford Swimming Club works alongside Bradford Council’s Sport and Culture Competitive Scheme for Swimming and Diving which delivers training session’s from Grassroots to Elite swimmers. For further information please contact Bradford Aquatics on 01274 438791. Hundreds of teachers, support staff and representatives of the district’s schools attended the Telegraph & Argus School Awards Ceremony to celebrate the stars of Bradford education and the good work being done in Bradford’s schools. The Leadership Award went to the late Gareth Dawkins, who passed away last year. Mr Dawkins had worked as principal of Bradford Academy since 2007 and previously led Challenge College in the city. The award was presented to his two sons and Bradford Academy’s current principal Tehmina Hashmi who paid tribute to him. The Secondary Teacher of the Year was awarded to Zaheer Jaffary, a PE teacher at Carlton Bolling College. Zaheer was nominated for his work with its girls’ cricket team in the school. Since he set up the team three years ago, it has achieved numerous awards, as well as breaking cultural stereotypes. The Primary Teacher of the Year was awarded to Elizabeta Butkovic, of St John’s CE Primary in Bierley. Mrs Butkovic fled her home during the Balkan crisis in the 1980s, ending up in Bradford. A teacher in her home country, she dreamed of once again teaching, and learned English, gaining qualifications and securing a job at St John’s 18 years ago. The Community Involvement Award, which recognises the work schools do to create stronger links with the wider community was awarded to The Syrian Action Team, pupils and staff at Dixons City Academy who organised events for refugees living in Bradford. The School Improvement Award went to Farnham Primary School, an inner city school where many pupils start not being able to speak English, after being ranked as “outstanding” by Ofsted inspectors last year. The Achievement Award went to Horton Park Primary School, which has become one of the best performing primary schools in the district for the progress its pupils make. The Newcomer of the Year Award went to Naomi Simpson, who works at Hazelbeck Special School in Bingley and is in her first year of teaching. The Support Staff Member of the Year was awarded to Lynne Dobson, who has been teaching the children of Peel Park Primary School art for years. The Voluntary Contribution Award went to Lesley Matthews, a Beanstalk reading volunteer at Atlas Primary School. Lesley said she hoped to encourage other people to become volunteers. The Business in Schools Category was awarded to The Business Friends of Haworth Primary School, a project that sees the school working with local businesses to give children real world business experience at an early age. Finally, the Governor of the Year Award went to Jackie Walters, who has been on the governing body at Newby Primary School for over 25 years. Staff and pupils at Hothfield Junior School, in Silsden, are celebrating after receiving an Ofsted report praising it for being good in all areas. The glowing report praises the school’s headteacher, teachers, pupils and governors for Hothfield’s success. The school’s leadership and management, quality of teaching and learning, pupils’ results and the personal development, behaviour and welfare of pupils are all rated as good. Pupils are said to be engaged in lessons and respond well to their teachers. Ofsted said their positive attitude to learning helped pupils to make good progress. The Ofsted report highlights the teaching of maths as a strength of the school and also praises its use of the Reading Challenge Initiative which is said to have been hugely successful in motivating pupils to read for pleasure. Inspectors praise children at Hothfield for their behaviour. The report says they are polite and go out of their way to greet visitors or hold the doors open for others. The school’s Headteacher James Procter said: “I am proud of the school’s pupils, parents and staff who make this school very special for the Silsden community. Later this year Hothfield Junior School and Aire View Infants School, in Silsden, are to merge to become Silsden Primary School. Staff at two nursery schools in Bradford are celebrating being given a top grade by Ofsted for the fourth inspection in a row – meaning they have been rated as outstanding for ten years. Lilycroft Nursery School and Midland Road Nursery School have both been judged to be outstanding in new reports praising the quality of early years education they provide. For both nursery schools it is the fourth consecutive time they have achieved this – having first been rated as outstanding back in 2007 in their first inspections after this top grade was created by Ofsted. Ofsted inspectors praise Midland Road for using its funding innovatively “through dance and outdoor play and teachers have woven the areas of learning skilfully into these session”. The school employs a dance specialist and a forest school specialist to deliver these sessions and was able to demonstrate the significant impact on children’s learning and progress. Lilycroft Nursery School is also given glowing praise in its new report published today. Inspectors say the school provides high quality teaching and provision for three and four-year-olds. It also praises the school for working hard to involve parents in their child’s reading and supporting them to do this effectively. Inspectors say parents have valued this support and comment on how well their children are progressing, particularly with language development. The two inspection reports mean that more than half of the nursery schools in the Bradford district are judged to be outstanding with the others all judged to be good. Two other Bradford nursery schools have been rated as outstanding by Ofsted. Canterbury Nursery and Centre for Children and Families, was given this rating earlier this year and St Edmunds’s Nursery School and Children’s Centre was rated as outstanding at its inspection last year – for the third time in a row. Winner of the Love Bradford poetry competition Caiomhe Richards, 11, with her winning entry which is framed inside a Bradford bus! The winners of a poetry competition who penned verse about life in Bradford now have their entries on display inside 100 local First West Yorkshire buses. More than 100 budding bards across Bradford entered the ‘Love Bradford’ poetry competition run by the National Literacy Trust Hub in Bradford in partnership with First West Yorkshire, the Telegraph & Argus and the Kirkgate Shopping Centre. The competition aimed to inspire and motivate reluctant writers, especially boys, to do more creative writing. The winning poems were judged by local poet, Joolz Denby and National Literacy Trust Hub in Bradford Manager, Imran Hafeez and are now on display as posters inside 100 First Buses, across Bradford. There were two categories, one for entrants in Year 3 to Year 5 and the other for pupils in Year 6 to Year 8. The winners are Caiomhe Richards, aged 11, for her poem ‘Memories’, and Suma Abdulla, aged 10, for her poem ‘Big Beautiful Bradford.’ They also won vouchers to spend at Kirkgate Shopping Centre and had their poems published in the Telegraph & Argus. The National Literacy Trust Hub in Bradford is a local solution to intergenerational low literacy in the district, working with Bradford Council to forge innovative partnerships with a range of sectors including business, sport, culture and health as well as voluntary and faith groups. The long-term initiative harnesses community assets to address poverty and unemployment through campaigning and targeted interventions to address priority areas. For more information, see here.